When two plants cross pollinate the results are hybrid plants. The hybrids of Lavender plants are called a Lavandin. On plant tags you might see Lavandula hybrida next to a name or maybe Lavandula intermedia. These created hybrids are referred to as a Lavandin, L. hybrida or Lavandula x intermedia. Also called Dutch Lavender. Many hybrida plant variations were bred during the 18th and 19th centuries and a great number of them were allowed to die out over the years since. The only means by which to reproduce these hybrids or produce these Lavandin plants is by taking cuttings. Learn how to take Lavender cuttings to start new plants. Lavandula hybrida var. Reverchon was one hybrid produced in France. This Lavandula hybrid was used a great deal in the manufacturing of Lavender soap due to the high amount of esters contained in its oil. Other Lavender hybrids which we still have today are Provence, Grosso, White Grosso, Hidcote Giant, Grappenhall, Grey Hedge, Seal, Super, Old English, Abrialis, Fred Boutin, Cathy Blanc, Dilly Dilly, Grosso Blue, Lullingstone, Castle , Silver Edge, White Spike, Dutch Mill and Alba (not to be confused with Lavandula angustifolia 'Alba'.) Woolly Lavender or Lavandula lanata boiss is another hybrida. Lavandula x intermedia 'Phenomenal' is a hardy Lavender developed and introduced by Peace Tree Farm in 2012. Phenomenal Lavender has exceptional winter survival, since it does not have that awful winter die back that other varieties like Munstead and Hidcote commonly exhibit. Shows above average tolerance of extreme heat and humidity but as with any Lavender the combination of wet soil plus heat equals a quick demise. Shows greater resistance to common root and foliar diseases as well. Phenomenal was named a 'Must-Grow Perennial' for 2013 by Better Homes & Gardens. Buy Phenomenal Lavender plants here. Buy 1 Quart size Phenomenal Plant. Lavandins produce a large quantity of essential oil that is also of high quality because it contains a higher amount of fragrant plant esters. The Lavandin is cultivated commercially because of their important value to bulk oil production. They also fare better against fungal disease and are hearty growers even though they do not produce the best essential oil. Essential oil from Lavandin is frequently used to cut the higher grade oils. You may buy pure Lavandin oil wherever you purchase pure essential oils. Oil of Lavandin is cheaper due to both the amount that can be harvested and because the odor is more camphorous than that of the other oils. For this reason it is used for scenting cleaning products, soap, and blended in Lavender perfumes where the the actual fragrance doesn't matter quite so much. These Lavandin plants are still beautiful and lovely in the garden. Due to the variety of form and color differences they provide highly desired visual interest in the planting. Lavandins are frequently tougher and more tolerant of growing conditions. 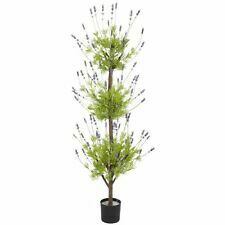 They produce and abundance of flowers on long sturdy flower spikes that are easily fashioned into Lavender wands and other dried Lavender arrangements. Growing Lavandin is sometimes easier for those that have trouble with other kinds of Lavender.